“New” is a little bit of an exaggeration. 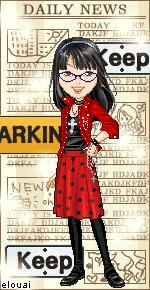 I have been working on it on and off since I was in Sisters. I finally got it right and am much happier with the result. 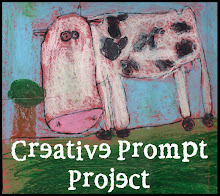 As is my process, I have already ripped the piece out several times. I finally realized that I didn’t like the weave. 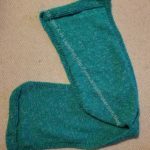 I was at my first knitting circle (local shop allows people to come in and free-knit once a week) and I talked to some of the ladies about it. I asked about going down a needle size or two. 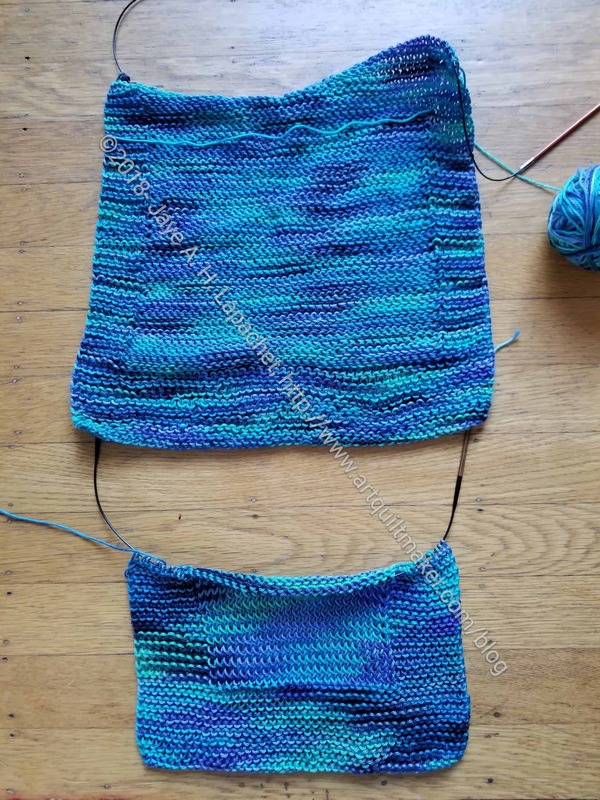 One said to knit a swatch. 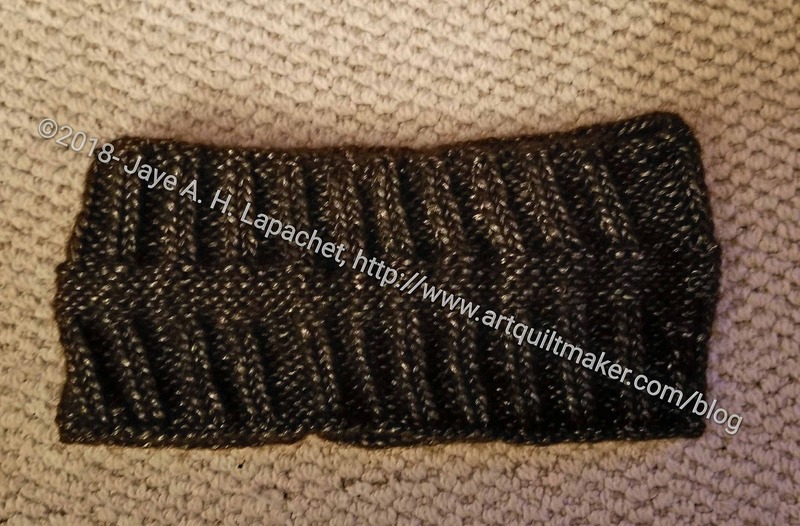 Since I don’t usually knit with a pattern, I have never knitted a swatch. I decided to do it with one needle size down. I wasn’t sure what to expect and ended up really liking the result. Now that I have made some progress, I think this was a good choice. 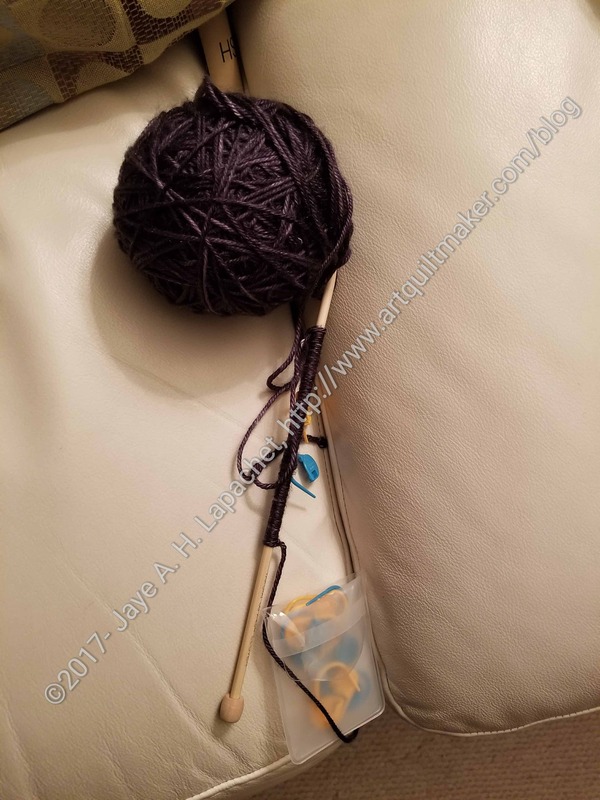 I always use the suggested needle size on the yarn wrapper. It worked okay this time; just not for me. 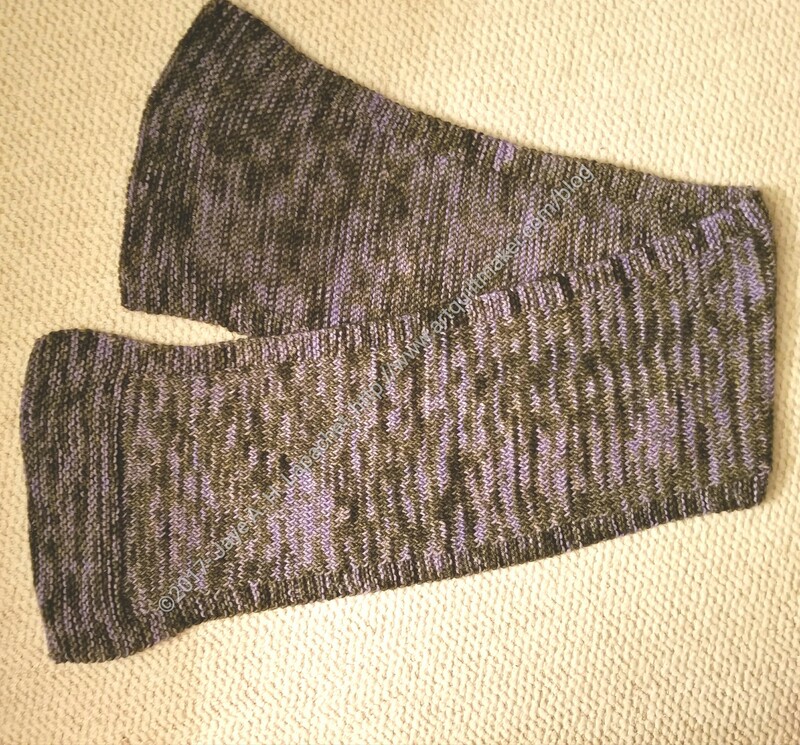 I also reduced the number of cast-on stitches, which I also think was a good choice. 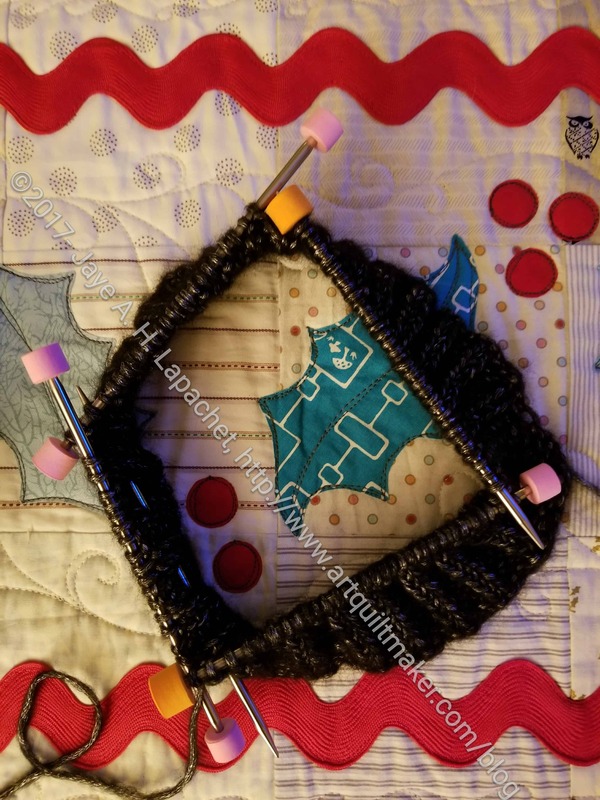 The image above shows the two bits of knitting. The top piece is the first piece I worked on using size 5 needles with 50 stitches cast on. The bottom piece is the piece on which I am working now. 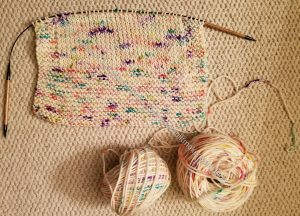 I cast on 45 stitches and am using size 4 needles. Aside from the size, because of the differences in cast on stitches, I don’t see a difference in the weave of the fabric. I noticed that the top piece was much looser (more holes) as I was working on it. Seeing them together makes me wonder if the change was worth the effort. 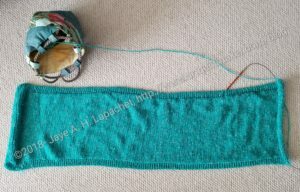 I am not sure what I was expecting, but it is surprising how well the smaller needles work. I love the small needles. I bought this yarn in Sisters and love the colors. I started knitting in Sisters, but have ripped it out at least three times since then. That is my process. I think this latest cast-on with stick. One issue I considered it making a shawl. My office can be cold sometimes and if I don’t want to wear my fleece inside, a shawl would be nice. I heard of a pattern where you start with a cast on of 2 and then continually increase. I did this for about 10 rows and then ripped it out. 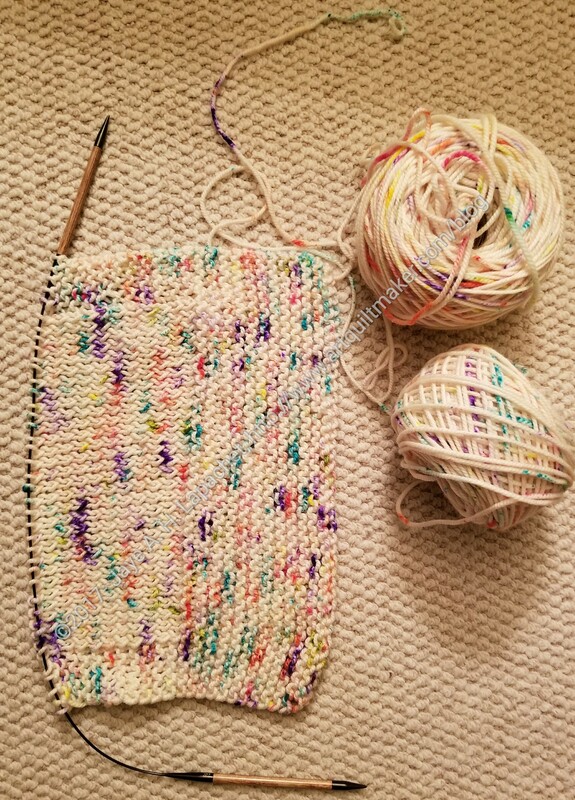 It looked messy and was not soothing to knit. 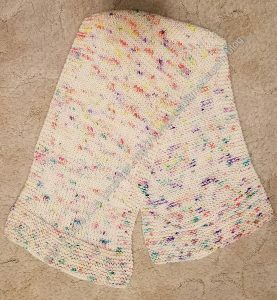 I will knit a large scarf for now and use that in my office and find a shawl pattern that isn’t such a PITA. 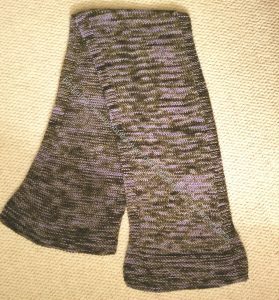 I have been quite remiss in writing about this scarf. 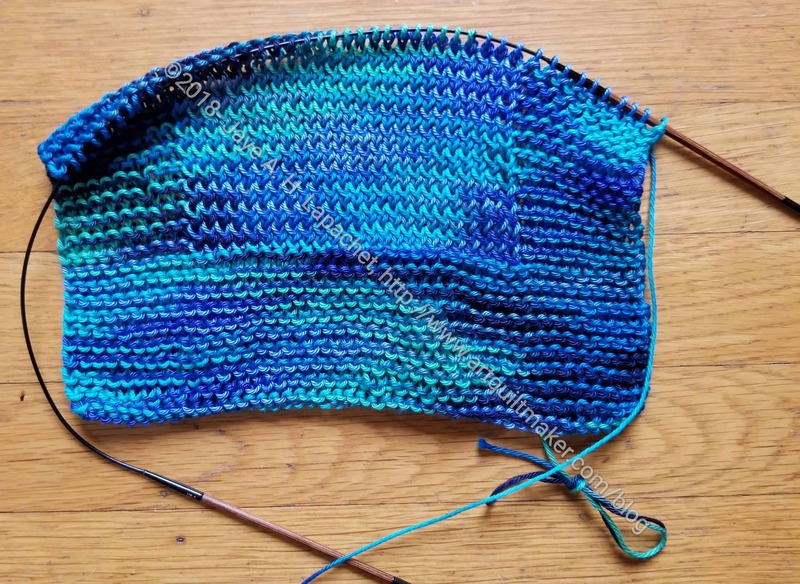 I am already halfway through the second skein. My mom is heading up an effort to provide holiday gifts for women at a domestic violence shelter in her area. They can’t give a gift to a woman unless they have enough of the same types of gifts to give to all of the women. Since everyone I know has already received a scarf, I thought I would contribute to this effort. I found the yarn at Tuesday Morning, which had just opened. I had never been in a Tuesday Morning and wanted to take a look. It doesn’t feel icky even though it is partially acrylic. Mom said that a bit of acrylic is better so that the women can wash the scarf in the machine. It is kind of a cheerful color, too. The YM came home complaining of cold wearing a thoroughly disreputable hat. I have knit hats before, so while we were lunching with Mom before Christmas we stopped at a knitting shop and he picked out some yarn. The yarn is not my ideal. It shreds and is very slidey. Still, now that I can easily discern when to knit and when to purl, I am on my way. 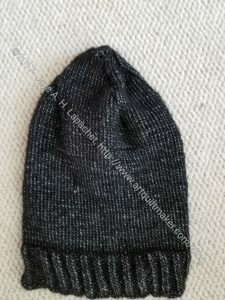 SIL gave me the first step in her hat pattern. I am getting to the point where I am going to need the next step. I will also need to be reminded how to decrease. 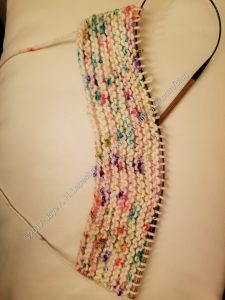 My knitting needles were barely cold before I cast on a scarf for the YM. I want him to have one as well. 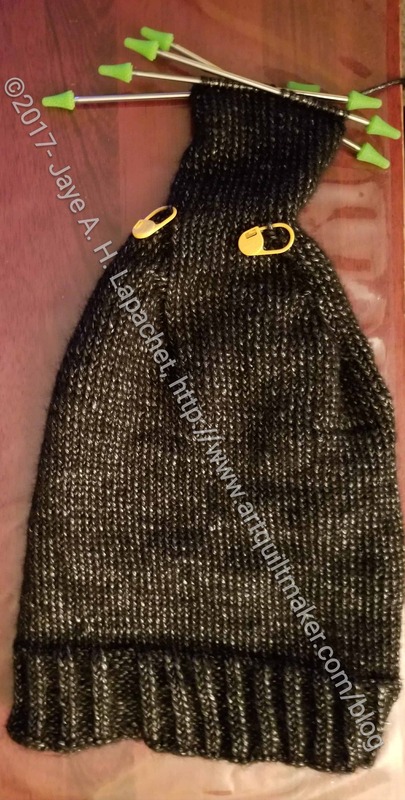 Almost as soon as I finished the Cosmic Wonder Dust scarf, I started his. He thought the Madeleine Tosh yarn was a little rough (he is very kinesthetic and also very tuned into the way things feel). At PIQF, I bought some wool and silk yarn from Thread and Ewe. It is Avalon yarn by Round Table Yarns – 50% superwash merino and 50% silk, DK weight. 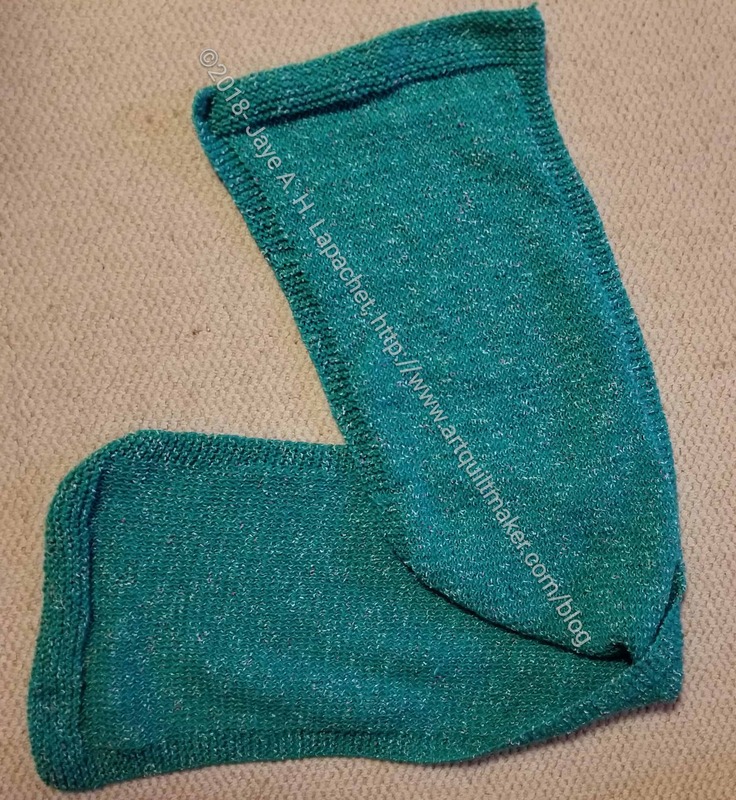 Even though I was annoyed at the “DK weight” – clearly designed for experienced knitters – I was eager to try it out. The fibers are not as tightly wound (spun???) 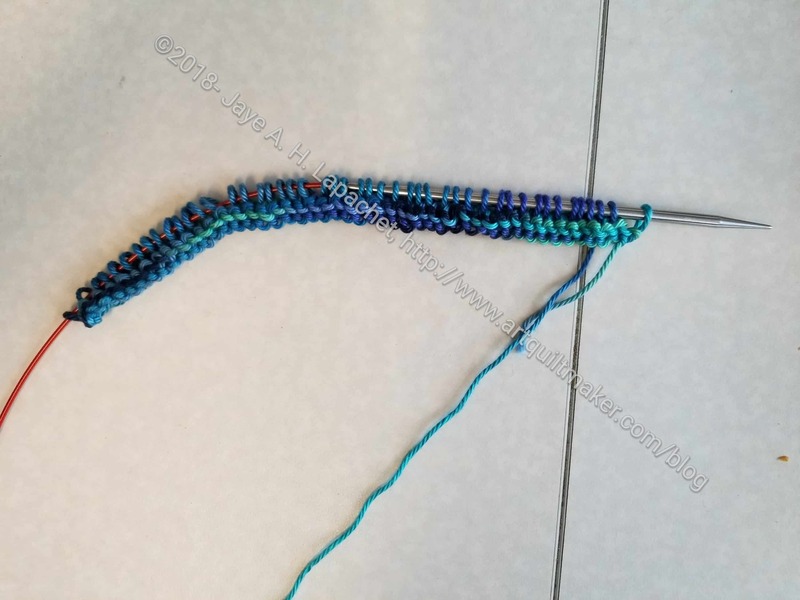 together, so I have to be careful not to knit only part of the strand as I progress along the row. 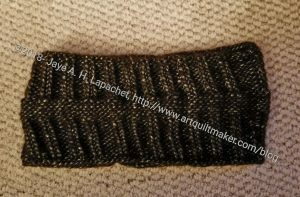 Like the Monarch scarf, this yarn is slippy, so the stitches tend to slide off the needles if I am not careful. While I cast on to straight needles, I am knitting with some circular needles and the line between them is a bit short, so I have to be careful. I really hope this yarn is soft enough for the YM. 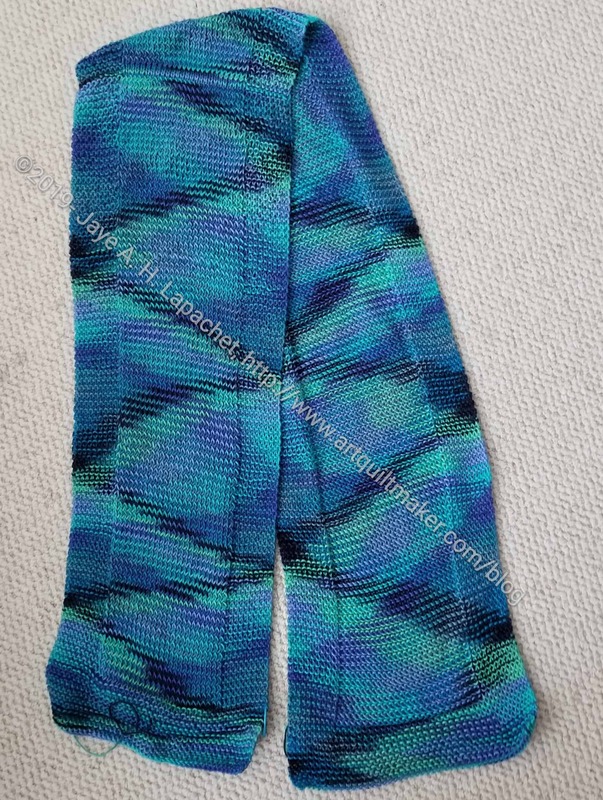 I finished the Cosmic Wonder Dust scarf last Thursday! Yay! Now I have all of the scarves finished for the kids uh, young adults who helped the YM during his cast phase. They are not wrapped or boxed or mailed, but knitted is a good place to be. 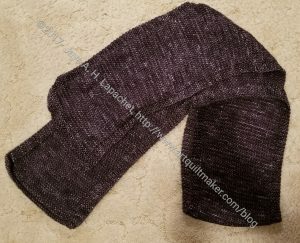 This was made with Madeleine Tosh Chunky yarn. 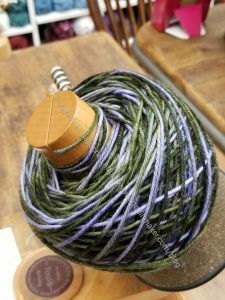 This yarn was a little different than the ones I used for the Lichen and Nighthawk scarves. it is Madeleine Tosh Chunky. It knitted up faster, though I didn’t have as much time to work on it. Good thing it was chunky yarn. The unexpected part is that it is not as long as the others. 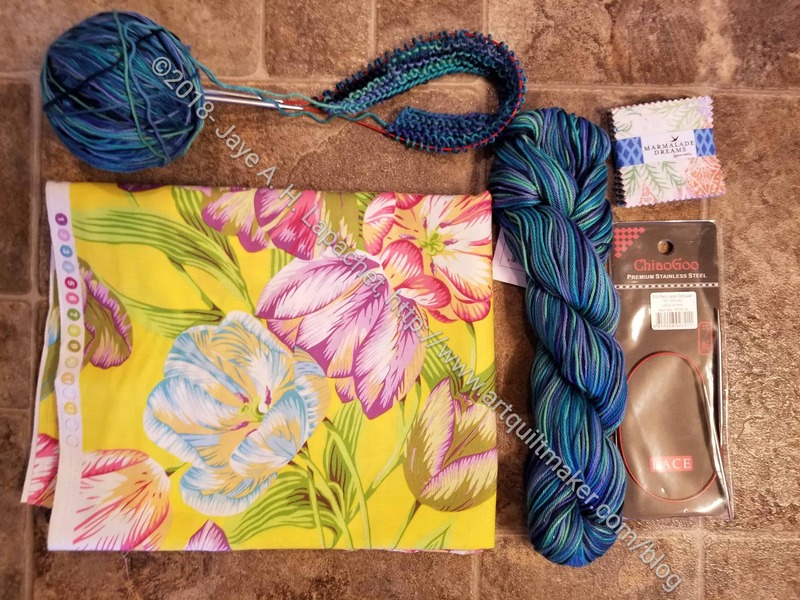 I should have bought three skeins, but didn’t. C’est la vie. I know the Nighthawk Scarf was barely cold in the box of gifts when I went and bought more yarn. There are not many yarn shops near me, so I have to take advantage when I can. There is one near my hairdresser and since I was getting a cut, I stopped and bought yarn as well. I bought two skeins of the yarn shown, which is Madeleine Tosh Lichen. 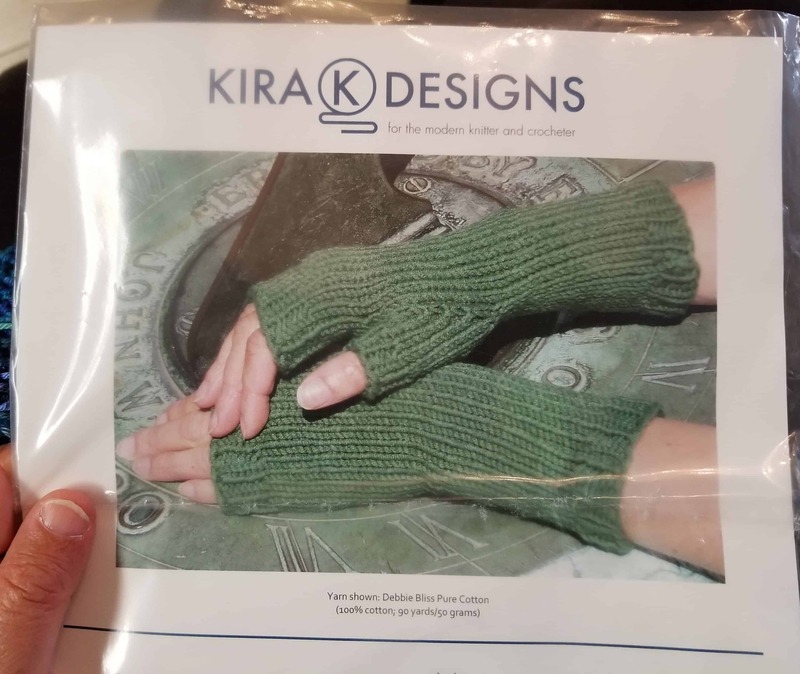 The person receiving this scarf-to-be likes dark green. I couldn’t find an all dark green skein, so this is what she is getting. I am not a huge green fan, so the purple and grey will relieve me a little bit. This is knit on size 6 needles, but I cast on to size 7s and then purl on to the size 6s to keep the curve from developing, like on the Nighthawk scarf. 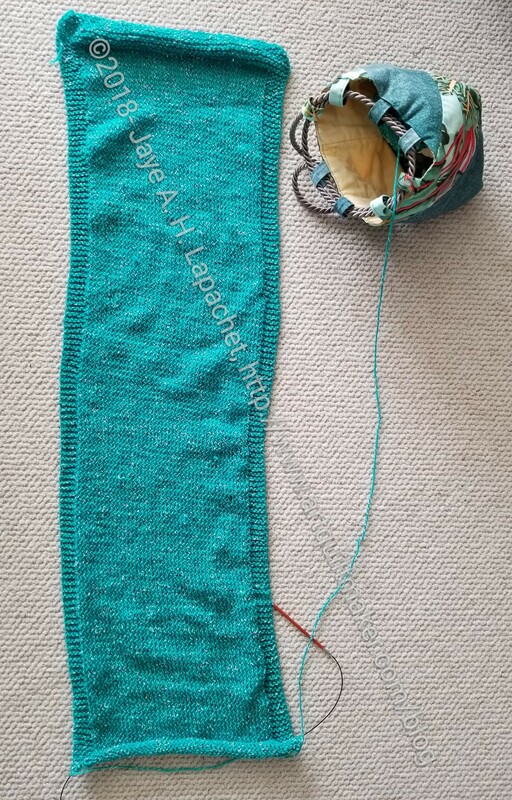 I really wanted to get started, but forgot my size 6 needles, so I haven’t gotten to it yet. Soon. 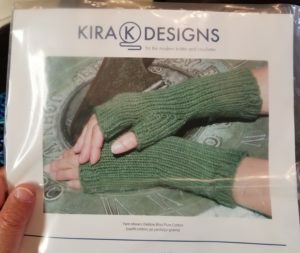 I was tempted to buy two additional skeins as well, but resisted. I really don’t want to start a yarn stash. I have a fabric stash and that is my limit.